Every American Girl® deserves a trendy pair of cut off shorts! Now you can give her what she needs with this easy to follow PDF doll clothes pattern. The shorts are designed with functional front and back pockets, an elastic waist, and a raw edge frayed hem. This pattern is also available bundled with 3 other stlyes in the Liberty Jane Jeans Bundle Pattern. Overall, the pattern is amazing and fits really well on the doll. I did have to make a couple adjustments in order for them to fit nicely, but the pattern is amazing as always. Thanks! The details in the decorative stitches are awesome. The Pockets are too cute. I did find adding an inch to bottom of shorts make them look even better. Pattern was fairly easy to follow. I had to read a couple of times, but made sense after that. I am very happy with the results. 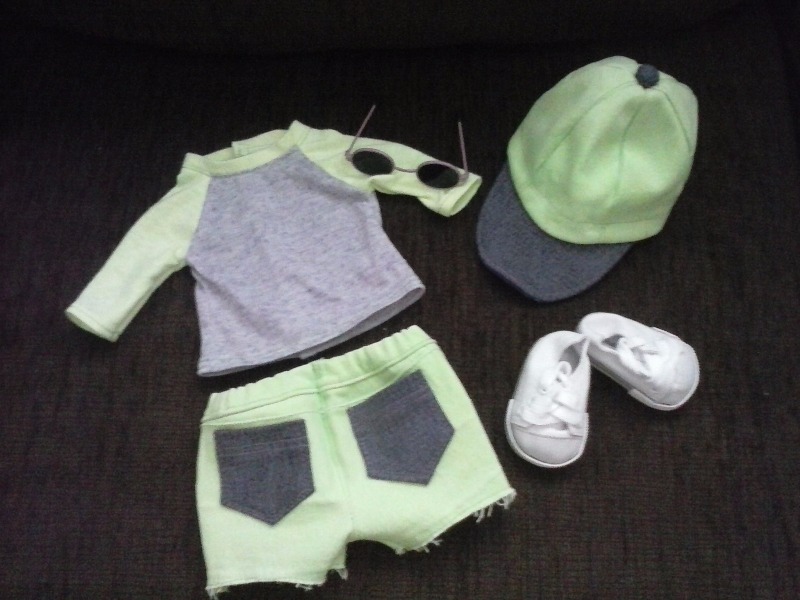 I used lime green denim for the shorts, with purple denim pockets. I am making a lime green baseball cap with a purple brim to match. Love this pattern! Who doesn't need a good pair of cut offs?! Cute & Fun. Well written.